After 5 days in the hospital, I’ll be getting sprung today! A visit somewhere away from home is always hard for me, even a vacation. I’m a Virgo, I love my home SO MUCH that when I’m forced to be away I feel oddly dislocated, not connected to my strength. My strength IS my home, my family, my pets and all of the familiar things that make my life so rich. So today, depending on whether the doctor comes to see me and give me the all clear, I’ll be heading home and I’m SO DAMNED GLAD! It’s not just because I’ve been here having chemo, although that’s a huge reason. Being someplace where fate compels you to experience pain and nausea isn’t fun, knowing I’ll have to return here at least twice more for two more sessions of my CODOX chemo is daunting. At least it’ll be happening in the autumn, my favorite time of the year, and I think that may make things a bit easier. The fact that this visit hasn’t been pure hell is due entirely to the chemo nurses here at St. Johns. They are such a wonderful bunch of folks, so caring and so careful! I hear how they interact with other patients who are in various states of comprehension and confusion, and of course I see how they deal with me, which is lovingly, as if I’m a family member! So this is my shout out to the nurses I’ve had the joy of dealing with this week, especially Abby and Liz, Jenn and Dale, who all had dealt with me when I was here in July with my original diagnosis and recognized me, even in my swollen, hairless state! It’s actually amazing to me how many folks remember me, the food service folks, the cleaners, the nurse’s aids (Hi, Josh!) and the auxiliary folks who make this place tick. When you think about it, I am so fortunate to have such a first class facility as St. John’s just 6 miles from my home, and THIS is the part of the cancer journey where I was happier to be back up in Maplewood than in Rochester. Mayo is amazing, but the ability to pick up the phone and see Gerry or Andy in 15 minutes if I REALLY need to is pretty amazing. 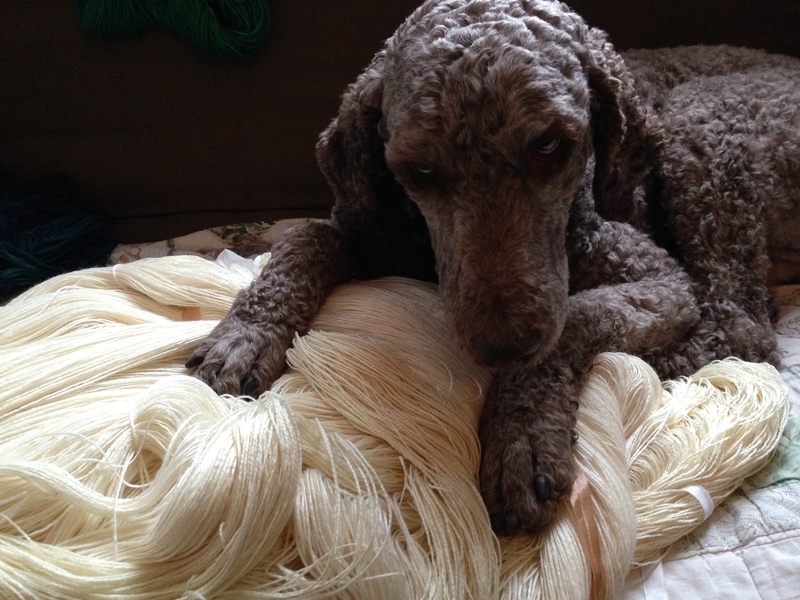 Yarn can’t assuage Jasper’s longing for his people. I only wish I could see Jasper, I think that would be good for both of us. Jasper is struggling with something right now, he’s been poorly, and he’s due for his rabies booster so we need to get him to the vets. His ears have been giving him problems for a while, he tends to get build-up in his left ear, for which we use medicated pads every day, and for the most part that tends to keep his distress under control. But now he’s just —off — and that is worrying to a pet owner, especially one who is not at home. And that is especially worrying when that pet owner tends to be the main person in that pet’s life, and I am that. Jasper is beloved by everyone now, but for the first few years we had him he was a difficult doggie. He was a rescue who was terrified of tall men, and broom, and had obviously been mistreated in some way. When a tall man would appear at our home for any reason, Jasper would stop, paralyzed with fear, and just pee. We became well versed in doggie diapers, he wore them off and on for almost 2 years, but S L O W L Y began to trust us more and more. As Max grew taller and more responsible we put him in charge of Jasper’s meals and walks, which made Jasper LOVE Max with a focus no one else in the family got from him! So Max being away from college and me being missing has got to be difficult for a dog who NEVER 100% settles down until all of his pack is at home! Well, boy, today one of your pack will be home to hug and love you, and get you to the vet for a check up and your boosters! This entry was posted in Chemo, CODOX=M/IVAC, Health, Lymphoma and tagged Home, Jasper by Annie Modesitt. Bookmark the permalink. To home and get the same chemo. I’m a Taurus and I love home and nesting so I feel the same about feeling out of place. Even actual vacations in the earlier days I’m counting the days to when I’ll be home (but by halfway into the trip I’m ready to chuck my job and stay forever). Jasper is worried for you. Our dog wanders around when my husband is not here and when he (husband) was recently in the hospital, our dog was really missing him. I hope you and Jasper are able to snuggle when you get home! Wishing for an uneventful discharge and good trip home! Hurray! Happiness! Virtual handsprings! Hoping that St. John’s has a good discharge protocol, so you don’t have to wait until mid afternoon to get home. Happiness for all at home, too, as you come home. Have you considered doing FaceTime or Skype with Jasper? He might be a bit confused about why mom is in that little box, but hearing your voice might help him! Oh Annie – I am thinking about you – checking back often – – hoping & praying that this is turning around in the RIGHT DIRECTION !!!! Hi Annie, hope you are doing as well as can be expected.